From Caerffili to Cheddar, the UK is home to some of the best cheeses in the world, which is why we’ve dedicated a whole market to it. Here’s a snapshot of some of our favourites. Made by the Holden family on Wales’ oldest organic dairy farm, delicious Hafod cheese is one not to be missed! Buttery, rich and nutty with a slightly tangy finish, Hafod cheese is made using raw milk from the family’s herd of 63 Ayrshire cows. Ayrshire milk has both high butterfat and protein levels, making it perfect for cheesemaking. For a behind-the-scenes look, find their herdsman, Nick, on Instagram. Award-winning artisan cheesemakers, these guys make Gorwydd Caerphilly, an unpasteurised cow’s milk cheese made by hand. Despite often considered a Welsh cheese, this particular. Caerphilly recipe originated in Somerset around 100 years ago. Firm and moist in the centre with a fresh lemony taste and a creamy, richer layer beneath the rind, check out Trethowan’s stall for a taste of the real thing. Celebrating 30 years of cheesemaking, Caws Cenarth are award-winning artisans of traditional Caerffili and modern Welsh cheeses. Gwynfor and Thelma Adams began making cheese in response to government milk quotas when they realised making cheese could help them keep within their allocated quota of milk production. Their venture was a success, and Caws Cenarth is now the oldest established producer of Welsh Farmhouse Caerffili. Try their plain Caerffili as well as their garlic and herb, and smoked varieties. 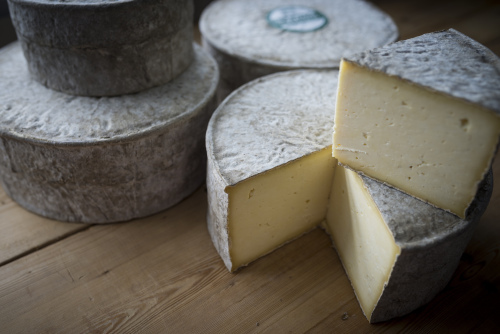 Using traditional recipes, time-honoured techniques and heritage starters passed down through generations, Quicke’s creates superb clothbound Cheddar. The Quicke’s family have nurtured their land in Devon for 14 generations, and take pride in every step of the cheesemaking process, from the quality of their grass to their herd of traditional dairy stock to the slow-maturation of their cheeses. Well worth a try! From distinctive Cheddars to a hard goat’s cheese, this specialist cheese company hails from the World Heritage site of Blaenafon, just a short drive from Abergavenny. Handmade at their shop, their cheeses range from their Blaenafon Cheddar – flavoured with a hint of Welsh whisky and ginger preserve – to their Pwll Mawr Cheddar, which is actually matured 300 feet below ground at the bottom of the mine shaft at Big Pit mining museum. A wonderful mix of creamy Welsh milk and Dutch expertise has created the award-winning combination that is Teifi Farmhouse Cheese. Set up in 1982 when John and Patrice Savage-Onstwedder moved from Holland to Wales, they began making Gouda from a centuries-old recipe, and have since moved on to make traditional Caerphilly and their renowned washed-rind cheeses; Celtic Promise and Saval. Discover more of the fantastic traders in this year’s Cheese and Wine Market. Want to know how to pair your favourite Italian wines with good Welsh cheese? Reserve your spot for our wine and cheese pairing masterclass.